Our “Service Heroes” feature has prompted a Thornton man to tell us about his remarkable father – a hero of the First World War. As a 20 year old, Fleetwood born Richard Rimmer was awarded both the Military Medal and Distinguished Conduct Medal. He had joined The Royal Engineers as a teenager – choosing a regiment to get him to the fighting as soon as possible. Within months the lad from Darbishire Road was in France. He earned his DCM at the battle of Loos in 1915 when – under shell fire – he laid telephone lines between trenches. Similar action at the Somme brought him the MM. Mr Rimmer – who latterly lived in Waring Drive, Thornton – died in 1982, he was 86. The official citation for the bravery awards paid tribute to Mr Rimmer’s great courage and determination and his conspicuous gallantry in action. As a signaller Mr Rimmer – who progressed through the ranks to sergeant – was attached to the Grenadier Guards. “He was later gassed at Passchendaele but carried on his duties until being discharged in 1919,” explained his son Mr Edwin Rimmer. His job was keeping open communications, laying wires. He had to go “over the top” under fire. Other comrades who went out with him were killed. “We once asked what it was like in the trenches and he pointed to a dyke (in Thornton) and said go and stand in that all night,” added Mr Rimmer. 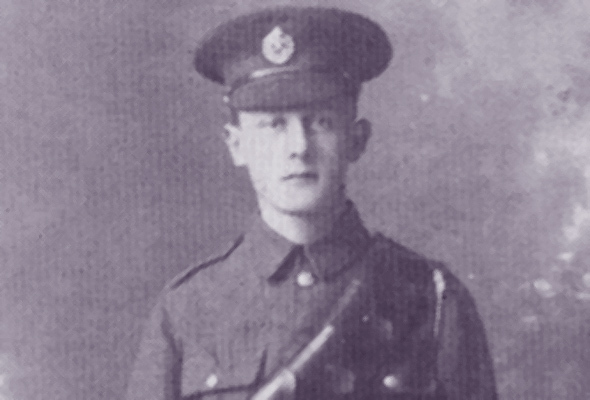 The heroes of trench warfare soon made an impression on the young lad from Fleetwood. He was soon in the thick of battle. “I remember him saying that he had been in France several months when he met some Fleetwood lads – just arriving. “He said he cried for them – they didn’t know what they were walking into,” said Mr Rimmer. His subsequent heroic deeds prompted a public subscription and an inscribed watch – from “Fleetwood Admirers, 1917″, was presented to the sergeant. “Mind you the collection was supposed to include cash for the local lads returning from the war to give them a start in civvy street. “But the money was eventually used for the memorial in the park. “This was something that upset dad all his life,” explained Mr Rimmer. Sgt Rimmer received his MM before a civic parade in Blackpool and the DCM before a military football match in Bloomfield Road in the presence of many of his comrades. Before going to war Mr Rimmer served his time as a shipwright with boatbuilders Joseph Armour at Fleetwood. Returning from the battlefronts he spent a further two years at Armours before going to ICI as a joiner. He returned after 40 years there. When the second war came along, his two sons joined up – and went to sea – one in the Royal Navy, the other in the Merchant Navy. “He urged us to join the navy – we would be sure to get regular meals – and a bed every night,” said Mr Rimmer. Sgt Rimmer was a remarkable man – a true hero of the great war. I only wish I’d had the opportunity to talk to the brave sergeant and record his memories first hand. Such memories must not be allowed to die and our thanks to Sgt Rimmer’s son Edwin for sharing his father’s recollections with us. First published in Life in Fleetwood issue 29, summer 1993. Registered office: 5 Crescent East, Thornton Cleveleys, Lancashire, FY5 3LJ. ©2014 Stripey Media Ltd. All Rights Reserved.